Labels on this page are intended for manufacturers and sellers of Class 3B lasers emitting visible beams between 5 and 499 milliwatts. These labels are copyright free, and are free to use or modify. Be sure any modifications conform to laws in the area where the laser will be sold and/or used. The top part of the label (yellow triangle, Class designation, and red eye hazard warning) conforms to IEC 60825. However you can replace this with any other label format which is legal in your area; see examples here. A label for Class 3B lasers with a tight beam whose minimum divergence is between 0.5 and 0.99 milliradians. This is the example label shown below. A label for Class 3B lasers with a wider beam whose minimum divergence is 1.0 milliradians or greater. For these generic labels, all a manufacturer has to do is add their name, country, and contact info (website or phone) at the bottom. If you need labels for Class 3B lasers with other powers, divergences or specifications, contact us. This is a sample of the Class 3B, 0.5 mrad version. We also have a 1.0 mrad version. See above for links to the full-size labels. State the actual wavelength of the laser. Note that this could also change the Visual Interference (glare) distances, because they are currently calculated for a worst-case green beam. State the actual output power; for example, if the laser only emits 125 milliwatts. Note that this would reduce both the Visual Interference distances and the Eye Injury distances. On outer (retail) packaging. Consumers can see this at the point of purchase. On marketing material such as a website or brochure. Again, this allows consumers to see this information before purchase. As a temporary label on the device (if the device is large enough) or a "hang tag" on the device. This is similar to an EnergyGuide sticker on appliances, or the pricing information on a new car's window. It can be read at time of purchase, and can later be removed. As information in the user manual. PRINTED SIZE: The type should be 7 points or larger. If the black bars are 2.5" wide, the type is approximately 7 points in size. This ensures that the text is readable, and that the QR code is sized for reliable scanning. 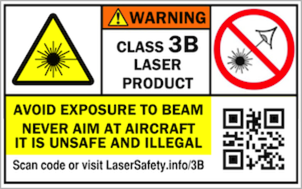 These labels are intended to be permanently affixed to any Class 3B laser with a visible beam that could be aimed at aircraft (e.g., portable, battery-powered devices). 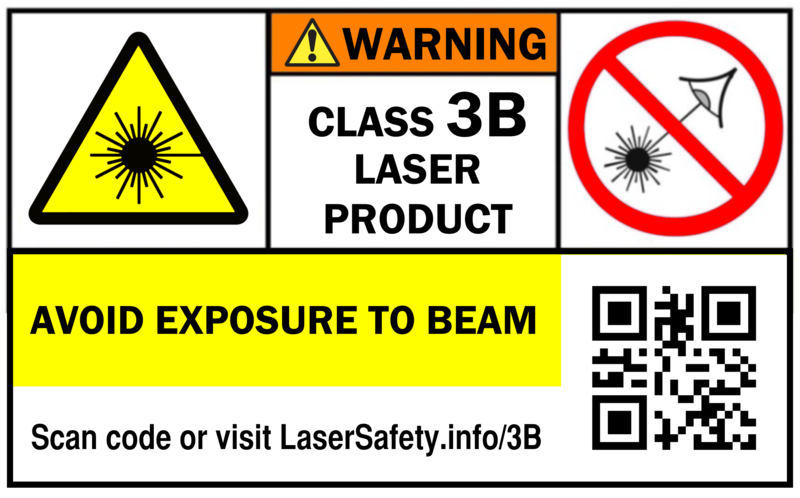 If the Class 3B laser product is large enough, it is preferred to use the full-size Laser Safety Facts label above. 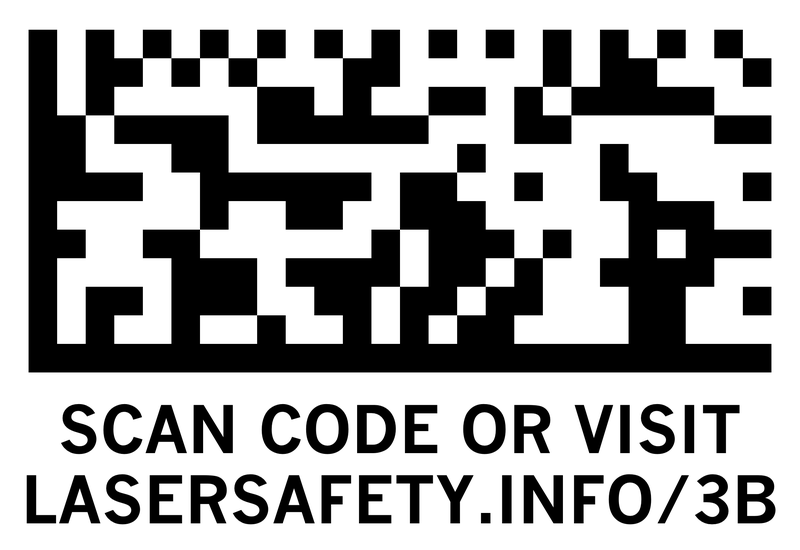 This version modifies the IEC 60825 label slightly, and adds the QR code plus a warning to never aim lasers at aircraft. Choose the format that fits best onto your laser and/or packaging, while remaining readable.The printed size should allow the QR code (printed part, not including white border) to be at least 1/2 inch (13 mm) wide. This ensures it can be read under normal conditions. Depending on regulations in your country, the laser product may also need other information on a label such as power, wavelength, manufacturer, etc. Consult your country’s regulatory authority for more information. Click on a label to get a full-size version suitable for printing. 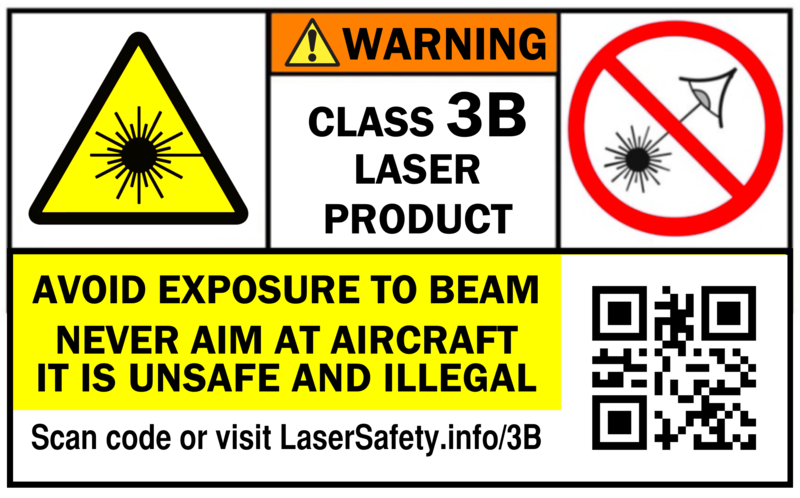 These labels are intended to be permanently affixed to Class 3B visible-beam lasers that are not likely to be used outdoors or otherwise aimed at aircraft. They do not contain the warning about aiming at aircraft. 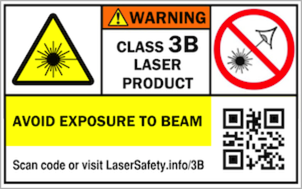 If the Class 3B laser product is large enough, it is preferred to use the full-size Laser Safety Facts label above. This version modifies the IEC 60825 label slightly and adds the QR code. Choose the size that fits best onto your laser and/or packaging, while remaining readable.The printed size should allow the QR code (printed part, not including white border) to be at least 1/2 inch (13 mm) wide. This ensures it can be read under normal conditions. The label below is for a Class 3B laser. The text underneath is important. It gives an alternate way of accessing the laser safety information -- by typing in the webpage URL. In addition, having the text underneath indicates that the barcode is for the user’s purpose, not the manufacturer’s. Click on the label to get a full-size version suitable for printing.